The Fallsview Sound & Light Show will mesmerize spectators, the show uses visual effects with a kaleidoscope of colour and texture treatments, visual transitions, with the addition of dynamic music and sound. The city-facing side of the Oakes Hotel will serve as the canvas for the Festival’s innovative projection lighting technology! 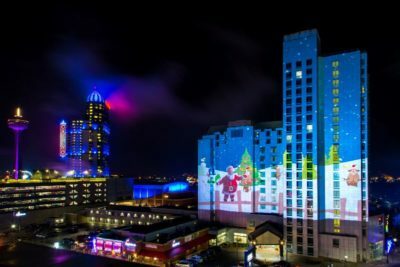 The new Fallsview Sound & Light Show for 2018/19 features a WFOL rendition of the classic story “Twas’ the Night Before Christmas” the 7-minute show will run every Thursday – Sunday at 7 pm and 8 pm. The building will be illuminated with eye-catching festive designs 6 – 9 pm while the show is not playing. The Ontario Power Generation Winter Festival of Lights was recognized with an award at the 2016 Digital Signage Expo APEX Awards. The Festival’s Spirit of Niagara Sound & Light Show earned the top award in the Arts, Entertainment & Recreation category at the awards ceremony that was held on March 16th, 2016.